Description: The crayfish is larger than the lobster, growing to about 600mm in length. It has long antennae but small hook-like claws. 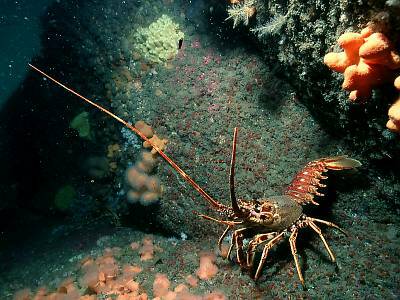 Habitat: Crayfish are found on open exposed rock faces and rocky seabed in the circalittoral and infralittoral zones. Numbers have been severely depleted on most coasts by tangle net fishing. Distribution: A widespread species on western coasts of the British Isles, becoming rather scarce in Scotland. Similar Species: The only other large crustacean with a similar shape is the lobster Homarus gammarus. Picton, B.E. & Morrow, C.C. (2016). Palinurus elephas (Fabricius, 1787). [In] Encyclopedia of Marine Life of Britain and Ireland.